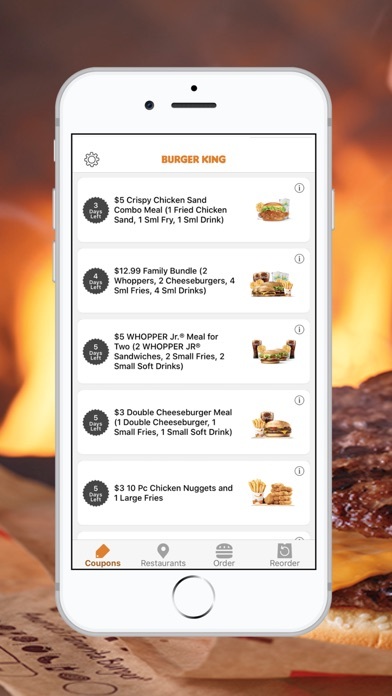 Get secret deals and exclusive mobile coupons with the official BURGER KING® app and save like a king! 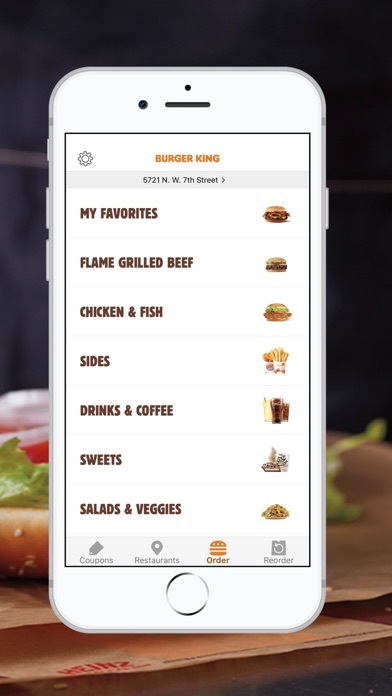 Explore our menu and find your nearest BK® restaurant anytime, anywhere. And in most locations, you can even order ahead. Specific features include: • Mobile Coupons: Get VIP access to the hottest mobile-only coupons and secret deals right from your phone. 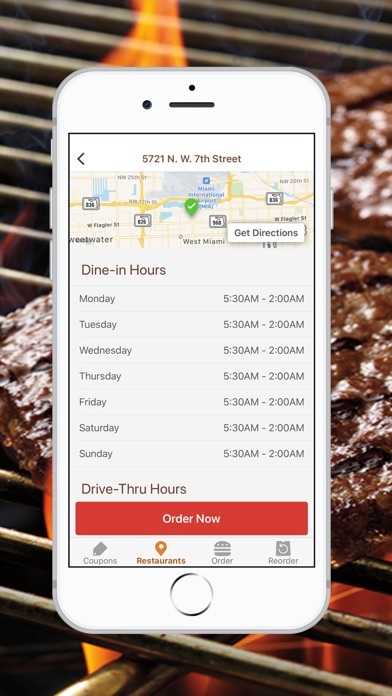 • Mobile Ordering: For select locations, order with the app and skip the line to enjoy your meal even faster. • Find Your BK®: Locate your nearest BURGER KING® restaurant and never leave those flame-grilled cravings unfulfilled. • Menu: Explore your BK® favorites and discover our hottest new menu additions. Plus, you can browse item descriptions and nutritional information at any time. 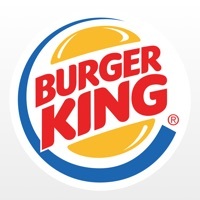 My wife ordered food from BK using this app. When she got to the restaurant the manager stated that her store didn’t participate. My wife showed the app purchase to the manager and she was rude. My wife and kids went home hungry. We called corporate and they didn’t believe us. We’re contacting our bank tomorrow. I can’t believe how bad my family was treated, I thought BK was supposed to be a reputable businesss. I’ve deleted the app and reinstalled it and it just says “could not update personal information at this time”. It says that all the time regardless of where or when I try to install it. The new mobile order only is a joke. I drive a truck and half the time there isn’t a location that accepts the mobile orders. Either that or I need to drive completely out of my way to get to one that does. That makes the couple of dollars I’d save meaningless because now I need to waste my time going sometimes 10+ miles away. 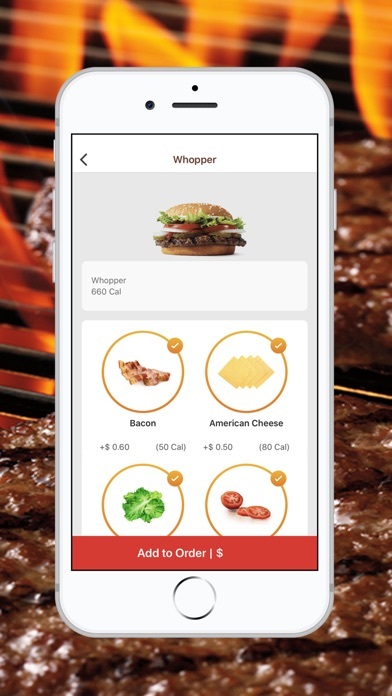 The app works OK but I feel it lets me down because I don’t have the ability to request that the burger come fresh off the broiler, or to put extra onions, ketchup, pickles, or cheese. To me that’s a fundamental flaw in the design of the app and will likely prevent me from using it thus resulting in fewer visits to Burger King itself. It says need update to new version So select ok It downloaded then when opened it just hangs with picture of whopper for hours Delete app reboot etc Same behavior so stuck in this loop! Broken as designed! Worked great when was just coupons to redeem in-store. Now has constant pop-up ads every time you load or switch away from the app. Many coupons now force you to order as mobile order which doesn’t let you upsize meals or pay with cash. Had a 3 cent burger promotion that crashed their servers so they just took it away instead and support can never help with any tickets. Avoid. Says update required to continue. I press update and the App Store says OPEN. Guess I'll order from a competitor, their app is working fine. Best food app around. Endless deals every day. I use these once a week it helps so much when you are on a budget but still want a burger! Only thing is the angry whopper coupon came out today and I tried using it for lunch and it said it wasn’t valid in my area. Hopefully soon! 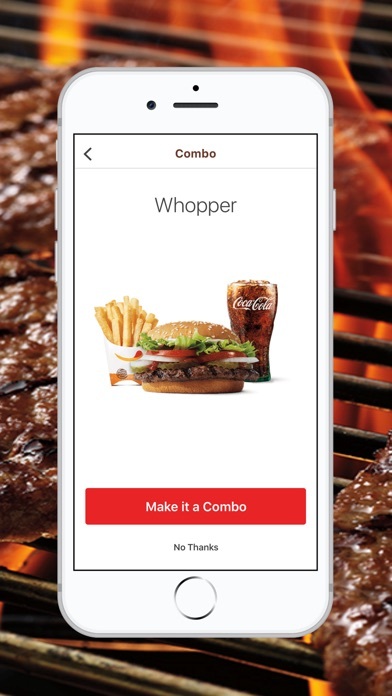 Why is it that the app doesn’t offer a HAMBURGER? Or at least allow you the option to remove the cheese to turn a cheeseburger into a hamburger.... it’s difficult to order my wife’s order because I can’t order a Hamburger. The McDs App is way better. First annoyance: I don’t live within 10 miles of a BK, so I always get the dumb notification that “there are no restaurants nearby.” Then I have to add whichever zip code, and wait for it to load all 3 stores. Why is there no “Favorite Store” option to save, to have something always visible?! I should not have to keep entering a location! Next issue: I want to be able to see the entire menu, regardless of it being “breakfast hours” or not! Lame that I have to wait till breakfast actually ends to look at or start a lunch order. I can’t save an item as a Favorite unless I actually order it?? Dumb. I’ve never had an issue regarding payments or a double charge, or a coupon not being accepted (thankfully!). The $5 a month coffee deal seems pretty sweet, but I only have a McDonald’s in town & I’m not usually up that early anyway lol. The app coupons are pretty much the same ones that come in the mail, which are decent for us. But they need to include some breakfast coupons again. Today there is a $3 Angry Whopper coupon. Can’t wait for that 3¢ Triple Stacker to show up 😁 So all in all, the app is mostly useless. It doesnt drive me to visit them. Hacked, do not attach your CC. Coupons are nice but gd. The day after making a mobile order, my bank account was hacked. 2 of the purchases were to a Burger King in the UK. I’m deleting this app immediately!!! I placed an order on the app, and it charged me twice when I got to the restaurant. The store manager said I had to contact the BK through the app, and then they told me I had to contact my bank because they couldn’t do anything about it. So as a frequent user of the BK app I was disappointed that the newest version does not support older iPhones. Oops! Guess I won't be going there anymore. I have had 2 recent charges through this app I didn’t make. It was purchased out of a state I have never been too or live in. BEWARE!!! I deleted the cards, canceled them, and deleted the app from my phone. What good is the app if you can’t use it. The app used to work very well but now the first thing that it wants you to do is login it won’t keep you logged in just want you to login. you login and then it wants the ZIP Code you enter the ZIP Code it will not go past that screen you can’t go back and order your sandwiches you can’t use it for anything whatsoever I have tried many times it doesn’t do any good it is just plain junk don’t waste your time. I thought I would try the mobile ordering for Burger King. I like McDonald’s, I do it at Wal-mart and Kroger. This app is NOT like those. This one is no good. So- I ordered from a Burger King that has a stand alone Burger King as well as one in the Walmart. I totally forgot about that one, and they are about 2 miles from each other. Anyways - I showed up (had to go in - no mobile bring it to me spots like elsewhere) and the workers informed me (not politely) that there are two Burger King’s, and that I should pay attention to which one I ordered from. I had already checked in the app that I was “here” so I scooted down to the Walmart real quick. I parked and walked in to discover the restaurant totally gated up with the lights off. I contacted customer service in the app. I had to re provide all my information, and sent about 10 emails back and forth. Then, customer service told me I had to contact the store (closed remember) or my bank to get my money back. He did provide me with an actual phone number to contact a real person. Guess what?! I have to wait for the store to contact me to get a refund. On something I never got, and that their system should have never processed in the first place. So - if you enjoy Burger King food- do NOT use the mobile order unless you are positive it will be processed right at your location. “Customer service” does not provide a service of any kind, and the app must be designed to steal from people. It certainly did with me. Used a coupon and the Marlboro NJ store wouldn’t honor it. They say they can only give me what the printer says. Beware of the app do not use it!! Manager told me that they do not like the app and asked me to call “BJ” who said there is nothing they can do about it because the app is a different company. Burger King locates at 700 Northway Dr. Anchorage, AK 99508 did not accept my coupon. They stated they do not accept cell phone coupons per policy. Seems odd... Wendy’s and McDonalds apps work fine and have never had a problem with accepting a coupon. This app will not let me create an account using Facebook. This app WILL NOT let me create an account using my email address. After inputting all the information in each box, the sign up box REMAINS GREYED OUT!!! I guess they want me to continue using my McDonalds app. Would prefer an option to pay with cash at the store instead of forcing me to use my card. No point to the app if I need to pay cash, I’ll just order at the store. What is the point of having an app for a fast food place that doesn’t have wide-spread support in this day and age? I don’t want to drive 4 mi to the nearest BK with mobile support. I want to use it at the BK whose parking lot I am in. Prices going up... Quality going down... Left behind by the digital age... I think Burger King is going to be gone and forgotten in a decade. Local restaurant doesn't have mobile order so no whopper deals for me! Restaurant won't honor and customer service useless. Wendy's and McDonald's gets my business! Used the app successfully for a while... the it stopped working and wants me to delete it and just start over. No really good bargains here anymore as most are two fer one meal deals. All I want is a decent price for a Whopper, not 2 Whoppers! Was nice to mobile order, have it almost ready when I walk in, have it handed to me, and it’s automatically paid for. Nice idea; no great deals for single, non soda drinker. Can’t pick restaurant. Says there is no restaurant within my area yet there is one. Today was the first and last time I'll use this app. I placed a mobile order at the location the app said I was closest to. That was not the case so when I went to pick up my food it wasn't ready. I tried to log back into the app to cancel but I was surprised to find that wasn't even an option. Then, I tried to prove I placed the order by going to order history. Again, not an option. My bank shows I paid twice but that wasn't good enough for the tech support people. They're unhelpful as well. Worked great, but unfortunately no longer works on my iPhone 5. Very convenient when traveling. Bought the 30 day coffee subscription for $4.99 and it never worked. Customer service was horrible, took multiple emails and still wouldn’t give me a refund. None of your coupons apply or work at your Hawaii restaurants. Useless for your Hawaii based Burger King customers. 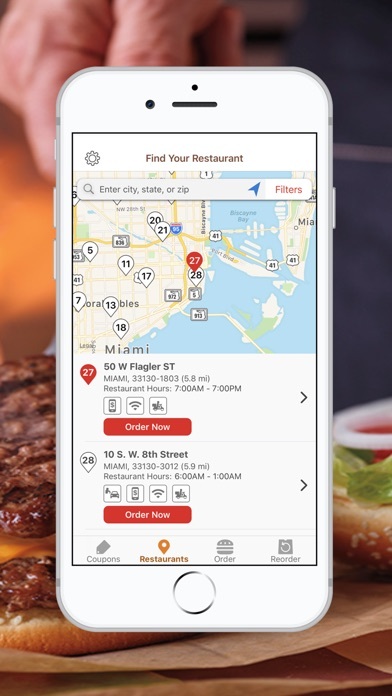 If you’re looking for deals, download the Wendy’s or McDonalds app. Those coupons actually work in Hawaii. Got charged twice contacted the number I was giving long story short it’s been a month & still haven’t received my money back . I ordered few salads and when I arrived to the store they told me that they didn’t make salads and they couldn’t provide me a refund, They told me to contact app support, I contacted BK app customer support by email and after wasting my time in few useless emails they told me to contact my bank and ask for refund, they literally stole my money and time. Won’t visit a BK again!!! Just downloaded your app. Won’t be using it. I’ve looked and and looked. I can’t find where you can customize the size of your iced coffee. The app is only letting me get a medium. Guess it back to Mc Donald’s for my coffee. How you are you going to repeatedly say I have a coupon for a 3 cent Triple Stacker King, and send me 3 notifications for it, then not give it to me? False advertising. The Burger King app send me notifications and never gives me the teaser great deal. Like the 1 cent Whopper by going near a McDonald’s and I did. Then it says you have 1 hour to get the deal. I went to Burger King and then the app failed. Other deals disappear so I have NEVER used the app. McDonald’s, Wendy’s and ChickFilA apps work really well. Getting ready to delete it. Sorry - I have too many old non-iOS 11 compatible apps to upgrade to iOS 11 at the moment, and the app requires the update to run - goodbye Burger King!!!! Terrible slow, glitches out. Never download this app unless you want your phone to go super slow. After deleting it my God my phone became fast again.